As a part of this competition I’ve entered I need to come up with creative ways to get noticed to win a trip around the world to go to a bunch of music festivals and interview bands etc etc. My plan is to create a short video that is complied of a whole bunch of people showing their support for my competition entry. It’s simple. 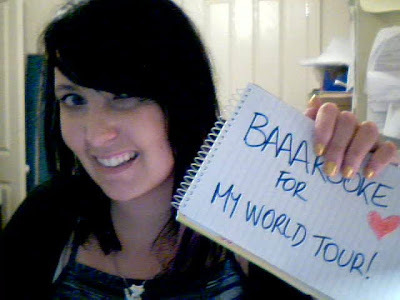 Grab a piece of paper, write on it “BAAAROOKE FOR MY WORLD TOUR”, take a photo of yourself with said piece of paper and email it to me! Get your family & friends to do it. Even if I don’t know them, you know me and know I’d be fantastic at this! I know a lot of people have Christmas parties / family gatherings coming up so if you could do this for me I’ll love you FOREVER! 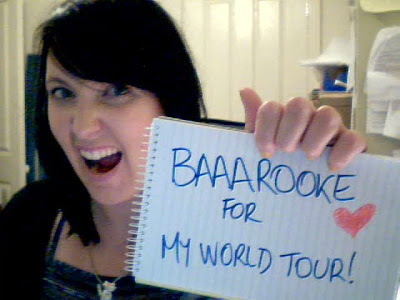 This idea won’t work without your love & support so please please please help me! P.S I just saw "Where The Wild Things Are" - it was a heartbreaking, stunning, beautiful, amazing movie! ohh! What competition is this for!?? wow that sounds really cool!!! BUT when do I have to send them to you by?? yeah another contestant already did this though (in fact two have done similar things)... the issue isn't doing the same thing, the issue is not crediting where credit is due. I have not seen another contestant do this already. Who has? I've had this posted since the start of December and have been collecting photos for quite a bit of time before posting about it here. It's pretty easy to post anonymously on someones blog without showing them WHERE exactly it's been done already. P.S Alex I need them by the end of December :) Thanks dear!